Far off in the distance you observe with dismay a symbol of government rule on the Playa. The white Capitol dome of the U.S. Senate looms obstinately on the horizon. Yet there is an essential quality to its surface, and the classical heavy Greek architecture seems to vibrate with strange and unfamiliar shapes. Upon your approach, the monolithic structure’s solid walls dissolve, and mythical creatures evolve before your eyes. You discover this symbol of the United States has been fabricated of elaborately carved white steel, its entire surface inhabited by faces, feathers, hands, eyes, eagles, monsters and humans morphing into birds. Everywhere your eye rests is rendered in the archetypal graphic style of Pacific Northwest Coast Indian imagery. Every inch of this iconoclastic structure tells a story of the illusion of power and the power of illusion. Entering inside one of the 20 eagle doorways is like stepping into a cage of white lace. The interior light-filled space vaults three stories overhead and a ladder of carved white swings descends from above. Together these elements create what seems to suggest the set of an elaborate birdcage, placed ironically and symbolically within the framework of a colonialist political power symbol. Yet the repeated symbol of the Eagle is the uniting symbol of both cultures and, for First Nations peoples, it is a creature that represents insight, the spirit world, and the quest for the higher self. 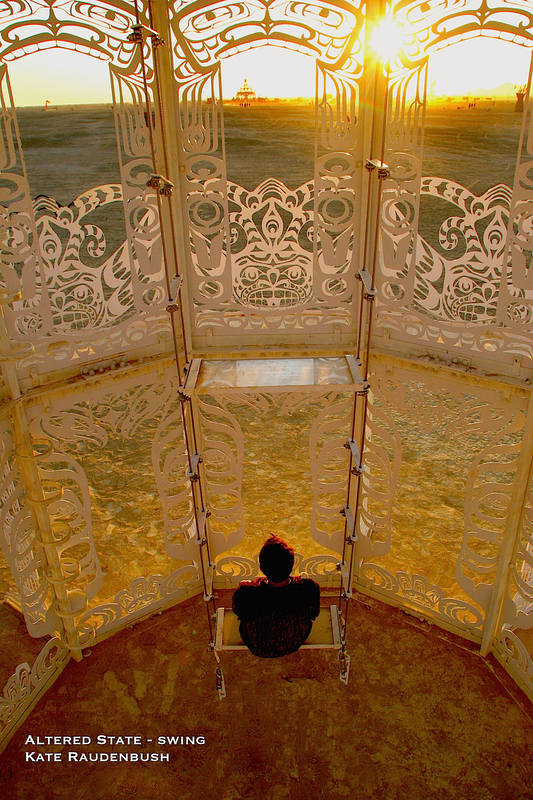 To that purpose, you ascend the swings into a vaulted dome of hundreds of carved eagle feathers. As one climbs upward, every platform reveals the wisdom of a different Indian Nation carved into the seats. This mythic structure is at its core a gathering space to ruminate on the origin of American “civilization” amidst the enduring power, dignity and vision of its Native Peoples. This monolithic government building is altered in a union of opposite ideas: the symbolic cage transforms into a carved temple of wisdom and transcendence. It has become an Altered State. Once again this year’s theme of the American Dream at Burning Man could not have been more culturally significant. There have been so many varied reactions and responses. Yet the timing speaks to the necessity of our community’s collective participation in our own culture: in reflecting it, questioning it, condemning it, exalting it and being present at this country’s moment in history, balanced between the mistakes of the past and the possibility of the future. At Burning Man, as in Native American culture, Art and its creation is intimately connected to ceremony, spirituality, and myth, within social and political systems. With American Dream, we craft the collective consciousness in physical form. Altered State is a commentary on the nature of power and it’s transformation. Who possesses it and at whose expense is it extracted? Is power ultimately an illusion? How could its fundamental values evolve? Altered State is a physical reflection of a union of these ideas in architectural form. On one level, it suggests the imposition of one power structure onto another. On an alternate level, it draws on the American’s use of heavy, imposing classical Greek architecture and radically transforms it into a First Nations temple of light and mythologically inspired lace. The inspiration for Altered State began as I reflected upon the theme of American Dream and asked the question who’s American? Whose dream? I thought of the Native Peoples of this country and sought to find a common symbolic and visual language that bonded them to American cultural symbols of today. The symbol that I adopted as my theme was the Eagle. In Native cultures, this majestic bird is a connection to the spirit world and the flight to the higher self. The down of eagle feathers is often sprinkled on guests during their ceremonies as a symbol of peace. The animal speaks to the concept of freedom in both Native and colonial cultures. But tellingly, in the American governments representation, the eagle is represented as more of a raptor bird, a symbol of pride, hegemony and global reach, than a symbol of spiritual reach. It is this disconnect that I seek to explore in Altered State. "This we know… the earth does not belong to man, man belongs to the earth. All things are connected like the blood that unites us all. Man did not weave this web of life; he is merely a strand within it. Whatever he does to the web, he does to himself." ~Chief Seattle, in a speech upon the request of the American government to purchase his tribes sacred land. Each level reached is a meditation, and is reminiscent of the eagle symbolism: an ascent to the higher self. Instead of feeling trapped in a cage, one feels uplifted, finding space to imagine the dignity of the native cultures pushed aside to make way for our own. Instead of physical imprisonment, the sculpture’s interior offers an altered state: an evolved and enlightened view of humanity’s place in the world. It is the spiritual made visible, as inspired by Native American art and thought.